Tai Chi Tai Chi Chuan is an ancient exercise, which embodies China's most profound concepts and principles of health and movement. Practicing Tai Chi offers true harmony between body and mind. Based on softness and awareness, rather than force and resistance, Tai Chi Chuan (Tai Chi, Tai Ji, or Taijiquan) has been recognized for centuries as both a method of self-cultivation and an unexcelled form of self-defense. 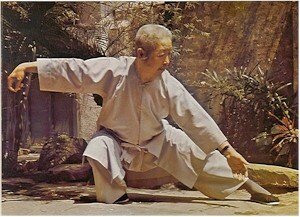 Tai Chi means "Supreme Ultimate." Practiced at a slow and even speed, Tai Chi promotes relaxation, straight posture, and balance. Tai Chi movements are widely acknowledged to help calm the emotions, focus the mind, and strengthen the immune system. In a very real sense, Tai Chi helps us to stay younger as we grow older, thus making an outstanding contribution to our overall health and well-being. The School of Tai Chi Chuan The School of Tai Chi Chuan has a direct lineage from Grand Master Cheng Man-Ch'ing through one of his most senior students, professor Patrick Watson who founded our school in 1975 as advised by Master Cheng. The hallmark of our Tai Chi school is team-teaching. Our method provides students with a friendly setting where the focus is on the clarity of the course material. Our students report that we teach with a balance of disciplined focus, inspiration, relaxation and humor. The school's teachers have all undergone thorough training, and meet regularly to improve their own level, and thus their teaching. All teachers are members of The Tai Chi Foundation; a non-profit-making educational organization dedicated to promoting, funding and teaching programs relating to the embodiment of Tai Chi.